Strolling on the beach we notice that our feet create dry spots around them. The sand around the leopard’s feet flows while it speeds along the desert. Close to the ocean, we often notice dark striations on the sand. These phenomena are so familiar to us that we hardly ever pause to wonder their origin. 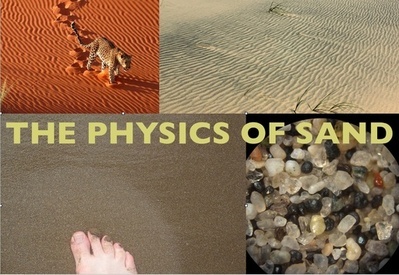 The surprising fact is that we do not really understand why sand behaves the way it does. Join us THIS Monday, June 3, at 6:00pm at the Elephant Walk in Waltham for our next Brandeis Café Science! Professor of Physics Bulbul Chakraborty will take you on a journey through the world of granular matter: matter made out of large objects for which gravity is important and temperature is not. This is stuff that we see around all around us but know very little about. For the last five years Prof. Chakraborty has been working on developing a theory of granular materials that can predict their collective behavior. How do sand grains assemble into sand dunes and what causes them to avalanche? Her research has led to a new paradigm for the emergence of solid-like properties. Prof. Chakraborty will take you along on her journey to the discovery of this new paradigm as she asks you the questions that she asked herself. From breakfast cereals to sand on a beach, granular materials are all around us. Under different conditions, these materials can exhibit liquid-like behavior (flowing) as well as solid-like behavior. The transition between solid and liquid phases has been known as the jamming transition. The basic concept of jamming is pretty intuitive. A simple example of what can induce jamming is the following: compacting loose sand inside a container increases its density. When the container is removed, the sand can form a self-supporting pile, hence becoming jammed. Jamming has been studied extensively in numerical simulations of systems composed of idealized grains without frictional forces. These studies find a critical density at which jamming occurs. Since these idealized granular materials are non-cohesive (no attractive forces between them) they can become solids only through externally imposed pressure, such as through compaction, and therefore a critical density makes sense. Real granular materials, however, have friction, and how this affects jamming is not well understood. 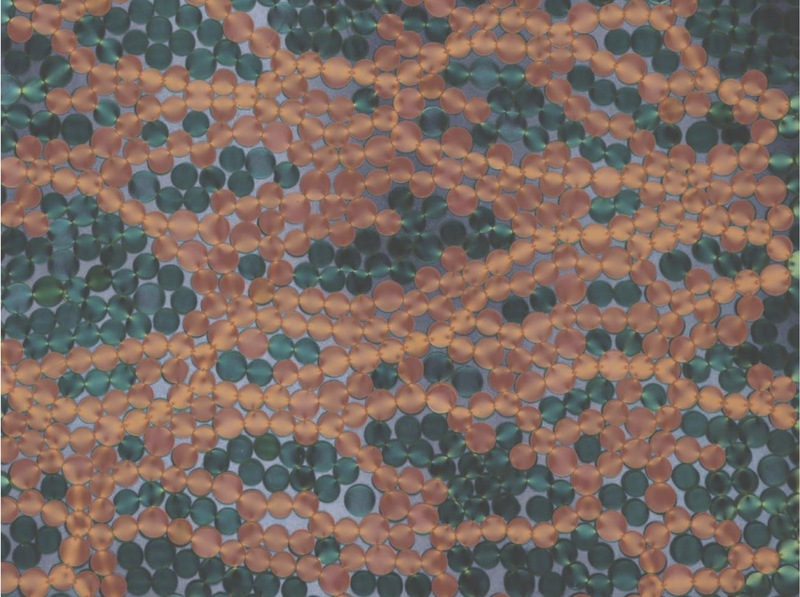 Newly published in Nature, are results of a collaboration between Prof. Bulbul Chakraborty’s group at Brandeis and Prof. Behringer’s group at Duke University, which show a new class of jammed states in frictional granular materials. This new class of “Shear-Jammed” states exhibits a richer phenomenology than previously seen. An initially unjammed or loose granular material can become jammed not just by increasing its density, but by applying shear strain on it while holding the density fixed. Shear-Jammed states are inherently anisotropic in their stress and grain-to-grain contact network (see photo above). The transition from an unjammed to shear-jammed state is clearly marked by a percolation of the strong force chains in all directions (see video below). The phenomenon of shear-jamming does not currently have a fundamental theoretical description. Ongoing work in Prof. Chakraborty’s group attempts to construct a theoretical framework for this non-equilibrium phase transition using a generalization of equilibrium statistical ensembles. This video shows the evolution of the strong force cluster and transition from unjammed to fragile and eventually to SJ. The video shows experimental states created under pure shear. Green colored grains form the strong force cluster defined in the paper. Initially, the system is unjammed. As the fraction of force bearing grains increases with increasing strain, the strong force cluster percolates in the compressive (vertical) direction and we call the state fragile. Eventually the system becomes percolated in all directions with sufficient number of force bearing grains. We call these states Shear Jammed. Bi D, Zhang J, Chakraborty B, Behringer RP. Jamming by shear. Nature. 2011;480(7377):355-8. This post is a companion to Brandeis in Aspen I, and describes a workshop attended by Bulbul Chakraborty and Aparna Baskaran at the Aspen Center for Physics. The format of Aspen workshops is different from the usual academic workshop. Each day has just one or two talks, which are primarily self-organized on a volunteer basis among the participants. The format is designed to encourage physicists working in a particular area to share research findings and enable cross-pollination of ideas in an informal and loosely structured setting. The workshop attended by Chakraborty and Baskaran was entitled “Fluctuation and Response in granular materials”. Granular materials are ubiquitous in nature and industry. Examples range from sand and other geological materials, food and consumer products, and pebble beds in nuclear reactors. Understanding and controlling the properties of granular materials impacts such diverse processes as oil recovery, nuclear pebble bed reactors, printing and copying, and pharmaceutical processing. Granular media pose difficult and unique scientific challenges that distinguish them from atomic, nano-scale, and colloidal materials. Being intrinsically out of thermal equilibrium, assemblies of grains readily become trapped in metastable states, are extremely sensitive to preparation conditions, and can have strongly time-dependent properties. Relaxing the constraints of thermal equilibrium, however, offers an advantage by opening up possibilities for creating novel static and dynamic phases that have distinctive functional properties. At Aspen, the one-on-one and small sub group interactions among the participants covered a wide range of topics that are at the forefront of materials research, however, the program as a whole primarily focused on two questions. The first question was: What do we understand about jamming of granular materials? Jamming is what occurs in everyday life when we are trying to get coffee beans out of a hopper and they suddenly stop flowing. We fix this by tapping on the hopper. But this same phenomenon when it happens in giant grain silos causes them to collapse. So, one of the challenges is to be able to predict jamming events. The role of the physicist here is to design and carry out experiments in minimal model systems and develop theoretical frameworks that lead to predictive models of observed phenomena. Statistical Mechanics provides a powerful theoretical tool to address this question and our own Professor Chakraborty is one of the leading experts in the theory of jamming. The participants at the workshop had several robust discussions on the current understanding of this phenomenon and theoretical and experimental challenges that remain to be addressed. The second question that the workshop focused on was : How does a dense granular material behave when sheared? Granular materials are called rheological fluids in that they exhibit shear-thinning and shear thickening behavior. In everyday life, we are all familiar with shear thinning. When we squeeze a tube of toothpaste, we are shearing it and it flows onto our brush. But once on the brush it stays put. This behavior is called shear thinning. Understanding rheology of granular materials is important for diverse applications ranging from pharmaceutical processes to being able to print well. The participants discussed in detail the physics of sheared granular materials and shared insight obtained from theory, simulations and experiments. All participants departed the workshop invigorated by the robust exchange of ideas, ready to address the challenges presented by these complex materials.